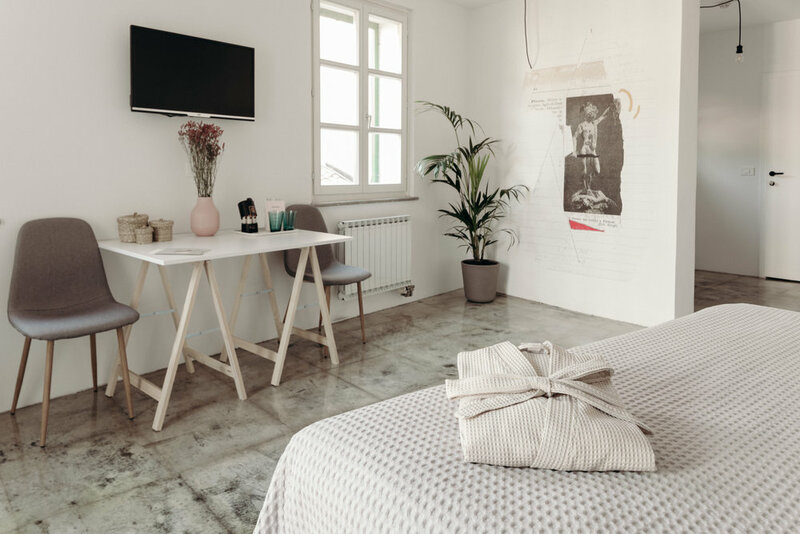 ART HOTEL TARTINI is situated in the heart of Piran’s vivid scene but offers the intimacy and personal approach of a tranquil boutique hotel. Our backyard and rooftop garden escape, connoisseur restaurant and cocktail bar offer and other charming amenities make us one of Piran’s most outstanding and one-of-a-kind accommodations. The summer of 2018 features a very special make-over for the renowned Hotel Tartini. Beloved of guests for decades, the hotel has been converted into the Art Hotel Tartini thanks to the intervention of world-renowned artist, JAŠA. JAŠA was given carte blanche to redesign the hotel, from painting murals on the walls to altering furnishings and spaces. The result is not only a comfortable, high-end hotel, offering all you could hope for, during your visit to Piran. It also now allows you to experience a multi-dimensional work of art, with components of architecture, painting, sculpture and more. Ever wanted to sleep inside a work of art? Now is your chance. 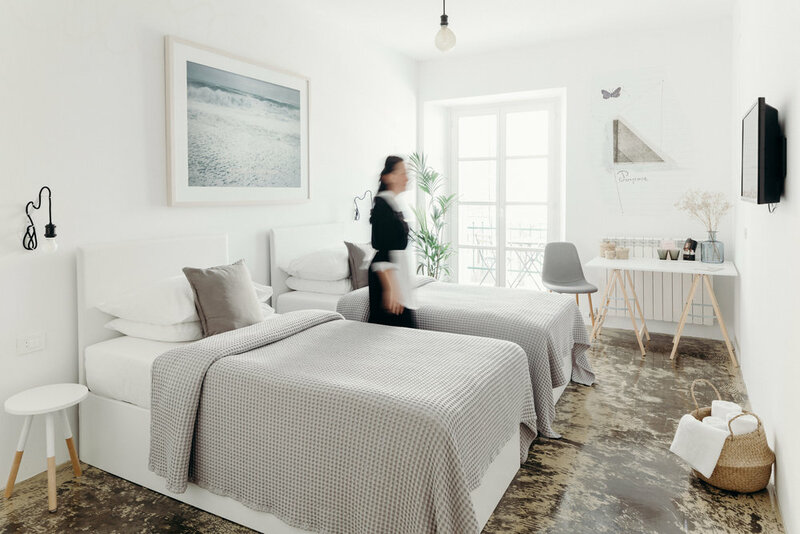 You can be among the first to enjoy the newly-remade Art Hotel Tartini, a great hotel offering all the amenities and a great new work by a famous Slovenian artist. Fit for one with a view overlooking the enchanting Tartini main square, including your small private balcony. The single room comprises a single bed, closet, desk and a plush chair. The room is adorned with original artwork and includes free high-speed wi-fi, a flat screen TV, Tivoli radio dock plus locally-stocked *Flaviar spirits selection. Locally-sourced delicious breakfast is included in the price. 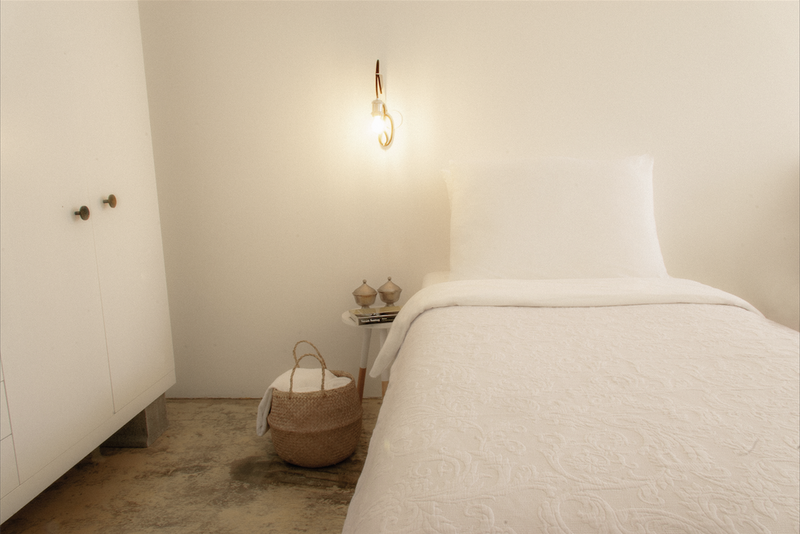 Whether you’re a couple or travelling solo, our double rooms are smaller in size but no less packed with comfort. They feature a sizeable double bed, a closet and plush seating, original artwork, free high-speed wi-fi, a flat screen TV and Tivoli radio dock. Locally-sourced delicious breakfast is included in the price. The Double is available with a view of lovely rooftops of Piran. Some of the rooms feature a private balcony. A large room with a sumptuous king-sized bed, closet, wooden table for dining or work and a seating area. The room features original artwork, free high-speed wi-fi, a flat screen TV and Tivoli radio dock. Locally-sourced delicious breakfast is included in the price. The Double Plus is available with a view of Tartini Square. The Double Deluxe are our most spacious rooms with luxurious king size beds or twin beds. They feature a sizeable closet, wooden table for dining or work and plush seating area, original artwork, free wi-fi, a flat screen TV and Tivoli radio. Locally-sourced delicious breakfast is included in the price. The Double Deluxe is available with a sea view featuring a private balcony. The Suite offers you one of the most splendid hotel experiences, with a stunning panorama of the glittering sea and the main square view. A spacious bedroom with a luxurious king-sized bed and an adjacent living room with sitting area, table, closet and plush chair, original artwork, free wi-fi, a flat screen TV and Tivoli radio. The bathroom features a large bath with a panoramic view and the room comes with your very own private terrace, which is the perfect setting to entertain guests in grand style. Locally-sourced delicious breakfast is included in the price. The cancellation is free of charge 7 days prior to the date of arrival, after this time we charge you 100% the room rate as cancellation fee. For the non refundable bookings are no cancellation or changes possible. In case of a cancellation, 100% of the total amount will be charged as cancellation fee. Guests booking more than 2 rooms are required to pay the total cost of the booking in advance. If cancelled or modified up to 60 days before date of arrival, no fee will be charged. If cancelled or modified later or in case of no-show, 100% of the reservation will be charged.